Adverse weather conditions, primarily for safety reasons, often do not allow the employees to work on construction sites, especially if they are involved in the construction of high-rise infrastructure related to communications or working on road reconstruction projects. A successful case history to keep in mind for a potential solution to this problem comes from a Cuba-Italy twinning. An overseas company, working in the telecommunications sector, has requested support from Giulio Barbieri S.r.l. 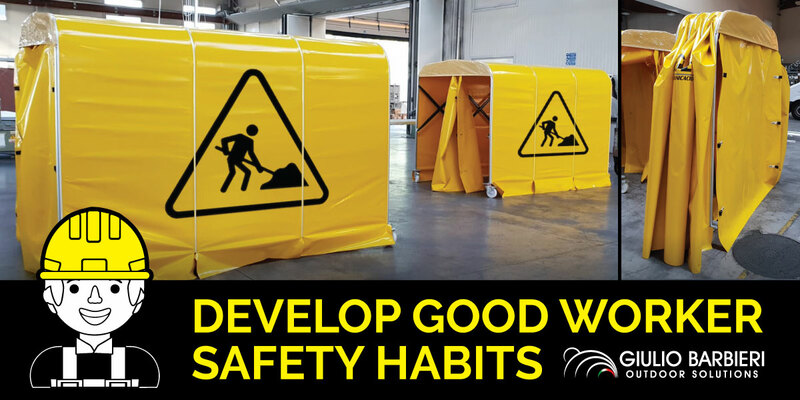 for the creation of a portable work tent, which is resistant, but at the same time light and easy to use, to shelter its employees on road construction sites, or during operations involving installation and connection of electrical cables. An outdoor activity, therefore, in which the company is frequently engaged, and that in case of rain or excessively high temperatures had to be interrupted or slowed down, with negative consequences on the timing of implementation. The company from Ferrara has recommended using Ready Box 1 as a portable work tent. It's a retractable aluminium tunnel, portable and easy to install, with PVC sheet covers, able to provide a shelter for operators. The Cuban company immediately responded to the proposal by commissioning the creation of 14 operator-friendly Ready Box 1, of rather compact dimensions, 3m x 3m and with a height of 182 cm, equipped with wheels to facilitate its relocation. Each retractable tunnel features a pantograph system that allows you to perform the operations of opening and closing in an easy way thanks to a practical quick-coupling lever. Once in the closed position, each extensible tunnel takes up only 23 cm of depth, allowing you to optimise the relocation procedures. To signal the presence of operators working under the roof, the aluminium tunnels have been customised with the colours used in the case of "men at work" and the relative icon has been added on each structure. The aluminium retractable tunnels identified as a solution to the problem took a considerably short time to design and build and this allowed the Cuban company to ensure the performance of its outdoor tasks even in adverse weather conditions while helping to improve the work safety conditions of its employees.